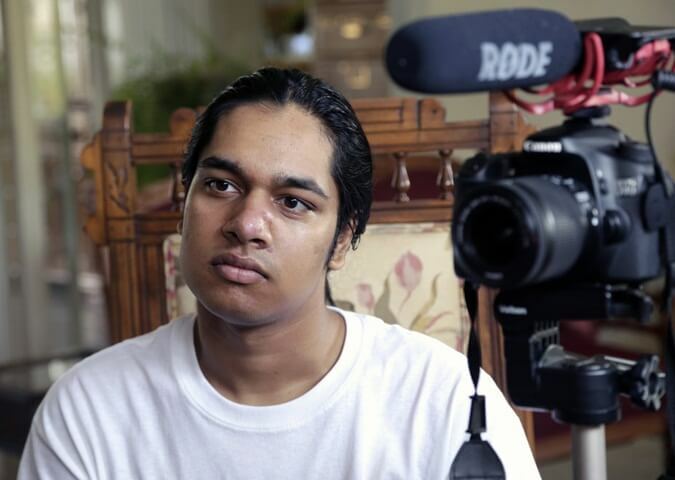 While the triumph of Indian American kids in the National Spelling Bee contests is the subject of Breaking the Bee documentary film by an American, an Indian American teenager is all set to record video interviews of the United States’ World War II heroes. Among the first-generation young Indians in California, Rishi Sharma grew up listening to the stories of bravery and sacrifice in the World War II, which instilled an overwhelming feeling of admiration in him for the war heroes of America. Fascinated by the pictures of the World War II, he cherished and nurtured a wish to learn the first-hand experiences of the American war heroes. Of the 16 million American soldiers who served in the Second World War, about 620,000 are in their 90s. About 400 war veterans breathe their last every day, according to a report by the National World War II Museum. When Rishi Sharma realized that neither there was a proper mechanism to preserve the fading memories and dying experiences of the grey-haired war veterans nor did the Library of US Congress have a sufficient collection of their stories, he took up this colossal task as his tribute to the American heroes who are nearing the sunset of their lives. He has estimated a period of 10 years to cover the video interviews of the US’ surviving WWII veterans. Unlike other 19-year-olds, he has buried himself in this noble project, keeping aside the typical priorities of his age like dating and finding a job. He raised about $3,300 through crowd-funding after his person savings fell short of the campaign. Los Angeles-based Rishi Sharma has already conducted video interviews of 160 Second World War heroes in Oregon and across the California Coast. The next destination is Arizona. He will be traveling to Hawaii to catch up with a few war veterans on December 7, the 75th anniversary of the Pearl Harbor attack. “These men are the biggest heroes of America. They are my closest friends too, in the sense that they unhesitatingly bare their mind to me in a censor-free environment. They have many untold stories to share and innermost thoughts to express. If this project didn’t happen to me, many unknown and lesser-known things about the World War II would have remained untapped. My project, Heroes of the Second World War, has no commercial aspects,” says Rishi Sharma from Los Angeles. If you would like to interview a Navy WAVE my mother is 94 and helped build aircraft carrier arrest cables in Philadelphia during WWII. Lives in DE. I am a veteran and have so much I would love to share with you. I left Mosul Iraq as a gunner in 2011 and was injured in the LOD in OIF. I received the combat action badge, the Armed force Reserve Medal, the ARCOM, and several others during the wars. I am from a military family that goes back hundreds of years. My dad was in Viet Nam. My POP was in WW II and landed in Normandy on D plus 7. Rishi, I watched your story on CBS Sunday morning . I was aghast. I’ve been wanting to preserve the stories of my still living, great uncle George’s experiences as a WWII Prisoner of war and I thought you too would be as interested as I in hearing these stories. I’m not sure how receptive he will be about telling a stranger as he doesn’t talk about it much anyway. He is in his 80’s and living in Isabelle, South Dakota. God Bless U My dad was navy my uncle Sam was infintry in germany both have passed. I have many stories if you ever come to New Jersey I will buy the Pizza. Please look me up. My father in law is a WW2 vet and will be 92 in Feb.
My dad is 96 and served in the army in the radio signal corp. He was assigned to headquarters and moved around London, Berlin, Paris- Versailles. He has wonderful stories that he can tell clear as a bell. Please contact me to interview him if you are interested. If possible, I can donate to your efforts. There is a man from the 384th Air Force bomb group looking for his comrades. How do we go about making this contact with you?